FLIP is an interesting word. It means many things, of course. It can be a transitive verb — to throw or toss, to spin, or to flick; an intransitive verb — to turn over, to somersault, or to move quickly and lightly; or a noun — the act of flipping, as in a flip of the wrist, a reversal, or a mixed drink made of alcoholic beverages often with beaten eggs. It has transformed into other words, too: flip-flop, flipbook, flippant. When I was fourteen or so, the age of the protagonist, Alex Grey, in this YA novel, the kids in my neighborhood used the word "flip" when they were frustrated. If, for example, you tried to make a layup when you were playing basketball and missed, you'd say, "Flip! I should've made that!" Martyn Bedford chose to call his main character by the moniker, Flip. It was also chosen as the title of his book. It was a careful and calculated selection, bringing lots of inherent connotation with it. It's selection is indicative of the care with which Bedford has constructed an adventure in the lives of Alex Grey and Philip "Flip " Garamond for any willing reader to consider. Flip denotes action: being turned over or around, the dizziness of spinning, the frustration of — not a missed basket — but a missed life. As a redheaded kid — or, as the British say, ginger-headed — with a freckled face, I identified with this story. Often, as a lad, I daydreamed about being popular, being athletic, having dark hair and skin that tanned, and being good-looking. Wished for it. "If only," I thought. Well, that's the basic premise in this book. Alex Grey plays the clarinet and likes chess. Boring. He sunburns and does relatively well in school; he doesn't get in trouble. He is not popular, there's nothing much about him to attract much attention. But all of that is, of course, backstory that unfolds after his life has flipped over and he has become Philip Garamond, a.k.a. FLIP the beautiful. If you were a coin and got flipped high into the air, turning over and over and over again before you alighted, you would be dizzy and disoriented. So, with a new identity, also come new challenges and responsibilities for Alex, who now is Flip. For as Flip, you have to live the life of someone athletic, of someone attractive, of someone prone to trouble; you have to put up with all of the intrusions of popularity and a whole new set of people to deal with. And it makes you think. It makes you wonder. It makes you analyze. As I finished the book, I said to myself, Flip! It's over! It wasn't a missed layup, although I'm still trying to figure out all of its meaning. Very nice job. 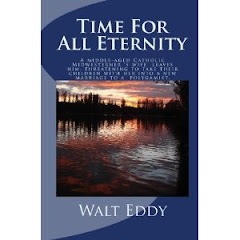 I wrote TIME FOR ALL ETERNITY.